Combined oral contraceptives, oral hormone replacement therapy and thrombophilias are recognised risk factors for venous thromboembolism in women. 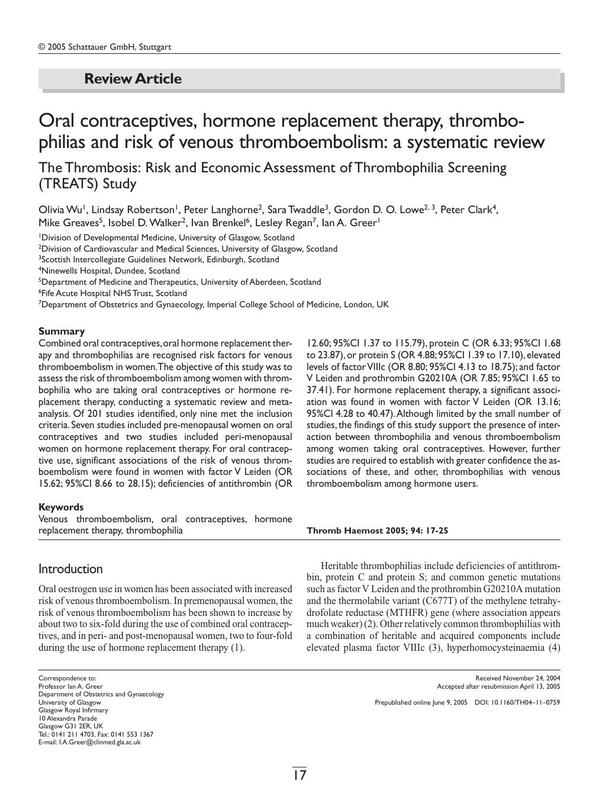 The objective of this study was to assess the risk of thromboembolism among women with thrombophilia who are taking oral contraceptives or hormone replacement therapy, conducting a systematic review and metaanalysis. Of 201 studies identified, only nine met the inclusion criteria. Seven studies included pre-menopausal women on oral contraceptives and two studies included peri-menopausal women on hormone replacement therapy. For oral contraceptive use, significant associations of the risk of venous thromboembolism were found in women with factor V Leiden (OR 15.62; 95%CI 8.66 to 28.15); deficiencies of antithrombin (OR 12.60; 95%CI 1.37 to 115.79), protein C (OR 6.33; 95%CI 1.68 to 23.87), or protein S (OR 4.88; 95%CI 1.39 to 17.10), elevated levels of factor VIIIc (OR 8.80; 95%CI 4.13 to 18.75); and factor V Leiden and prothrombin G20210A (OR 7.85; 95%CI 1.65 to 37.41). For hormone replacement therapy, a significant association was found in women with factor V Leiden (OR 13.16; 95%CI 4.28 to 40.47).Although limited by the small number of studies, the findings of this study support the presence of interaction between thrombophilia and venous thromboembolism among women taking oral contraceptives. However, further studies are required to establish with greater confidence the associations of these, and other, thrombophilias with venous thromboembolism among hormone users. 1 Rosendaal FR, Van Hylckama Vlieg A, Tanis BC. et al. Estrogens, progestogens and thrombosis. J Thromb Haemost 2003; 1: 1371-80. 2 Walker ID, Greaves M, Preston FE. on behalf of the Haemostasis and Thrombosis Task Force British Committee for Standards in Haematology. Investigation and management of heritable thrombophilia. Br J Haematol 2001; 114: 512-28. 3 Koster T, Blann AD, Briet E. et al. Role of clotting factor VIII in effect of von Willebrand factor on occurrence of deep-vein thrombosis. Lancet 1995; 345: 152-5. 4 den Heijer M, Koster T, Blom HJ. et al. Hyperhomocysteinemia as a risk factor for deep-vein thrombosis. N Eng J Med 1996; 334: 759-62. 5 Clark P, Walker ID. The phenomenon known as acquired activated protein C resistance. Br J Haematol 2001; 115: 767-73. 6 Greer IA, Walker ID. Hormone replacement therapy and venous thromboembolism. Royal College of Obstetricians and Gynaecologists 2004; Guideline No. 19 1-9. 9 Stroup DF, Berlin JA, Morton SC. et al. Meta-analysis of observational studies in epidemiology: a proposal for reporting. Meta-analysis Of Observational Studies in Epidemiology (MOOSE) group. JAMA 2000; 283: 2008-12. 10 Santamaria A, Mateo J, Oliver A. et al. Risk of thrombosis associated with oral contraceptives of women from 97 families with inherited thrombophilia: high risk of thrombosis in carriers of the G20210A mutation of the prothgrombin gene. Haematologica 2001; 86: 965-71. 11 Martinelli I, Taioli E, Bucciarelli P. et al. Interaction between the G20210A mutation of the prothrombin gene and oral contraceptive use in deep vein thrombosis. Arterioscler Thromb Vasc Biol 1999; 19: 700-3. 12 Vandenbroucke JP, Koster T, Briet E. et al. Increased risk of venous thrombosis in oral-contraceptive users who are carriers of factor V Leiden mutation. Lancet 1994; 344: 1453-7. 13 Andersen BS, Olsen J, Nielsen GL. et al. Third generation oral contraceptives and heritable thrombophilia as risk factors of non-fatal venous thromboembolism. Thromb Haemost 1998; 79: 28-31. 14 Spannagl M, Heinemann LA, Schramm W. Are factor V Leiden carriers who use oral contraceptives at extreme risk for venous thromboembolism?. Eur J Contracept Reprod Health Care 2000; 5: 105-12. 15 Legnani C, Palareti G, Guazzaloca G. et al. Venous thromboembolism in young women; role of thrombophilic mutations and oral contraceptive use. Eur Heart J 2002; 23: 984-90. 16 Bloemenkamp KW, Helmerhorst FM, Rosendaal F. et al. Venous thrombosis, oral contraceptives and high factor VIII levels. Thromb Haemost 1999; 82: 1024-7. 17 Herrington DM, Vittinghoff E, Howard TD. et al. Factor V Leiden, hormone replacement therapy, and risk of venous thromboembolic events in women with coronary disease. Arterioscler Thromb Vasc Biol 2002; 22: 1012-7. 18 Grady D, Applegate W, Bush T. et al. Heart and Estrogen/progestin Replacement Study (HERS): Design, methods, and baseline characteristics. Control Clin Trials 1998; 19: 314-35. 19 Herrington DM, Reboussin DM, Klein KP. et al. The Estrogen Replacement and Atherosclerosis (ERA) Study: Study design and baseline characteristics of the cohort. Control Clin Trials 2000; 21: 257-85. 20 Rosendaal FR, Vessey M, Rumley A. et al. Hormonal replacement therapy, prothrombotic mutations and the risk of venous thrombosis. Br J Haematol 2002; 116: 851-4. 21 Juul K, Tybjaerg-Hansen A, Schnohr P. et al. Factor V Leiden and the risk for venous thromboembolism in the adult Danish population. Ann Intern Med 2004; 140: 330-7. 22 Lensen RP, Rosendaal FR, Koster T. et al. Apparent different thrombotic tendency in patients with factor V Leiden and protein C deficiency due to selection of patients. Blood 1996; 88: 4205-8. 23 Emmerich J, Rosendaal FR, Cattaneo M. et al. Combined effect of factor V Leiden and prothrombin 20210A on the risk of venous thromboembolism: Pooled analysis of 8 case-control studies including 2310 cases and 3204 controls. Thromb Haemost 2001; 86: 809-16. 24 Bloemenkamp KW, Rosendaal FR, Helmerhorst FM. et al. Enhancement by factor V Leiden mutation of risk of deep-vein thrombosis associated with oral contraceptives containing a third-generation progestagen. Lancet 1995; 346: 1593-6. 25 Lowe G, Woodward M, Vessey M. et al. Thrombotic variables and risk of idiopathic venous thromboembolism in women aged 45–64 years. Relationships to hormone replacement therapy. Thromb Haemost 2000; 83: 530-5. 26 Scarabin PY, Oger E, Plu-Bureau G. Differential association of oral and transdermal oestrogen-replacement therapy with venous thromboembolism risk. Lancet 2003; 362: 428-32. 27 Perez Gutthann S, Garcia Rodriguez LA, Castellsague J. et al. Hormone replacement therapy and risk of venous thromboembolism: population based case-control study. Br Med J 1997; 314: 796-800. 28 Varas-Lorenzo C, Garcia-Rodriguez LA, Cattaruzzi C. et al. Hormone replacement therapy and the risk of hospitalization for venous thromboembolism: a population-based study in southern Europe. Am J Epidemiol 1998; 147: 387-90. 29 Egger M, Juni P, Bartlett C. et al. How important are comprehensive literature searches and the assessment of trial quality in systematic reviews? Empirical study. Health Technol Assess 2003; 7: 1-76. 30 Schambeck CM, Schwender S, Haubitz I. et al. Selective screening for the Factor V Leiden mutation: Is it advisable prior to the prescription of oral contraceptives?. Thromb Haemost 1997; 78: 1480-3.